The 2016 primary battle heads West Tuesday night as three states hold key contests that will help determine if and when Republican frontrunner Donald Trump and Democratic leader Hillary Clinton are able to secure their parties' presidential nominations. Democrats are going to the polls in Arizona, as well as caucuses in Idaho and Utah. 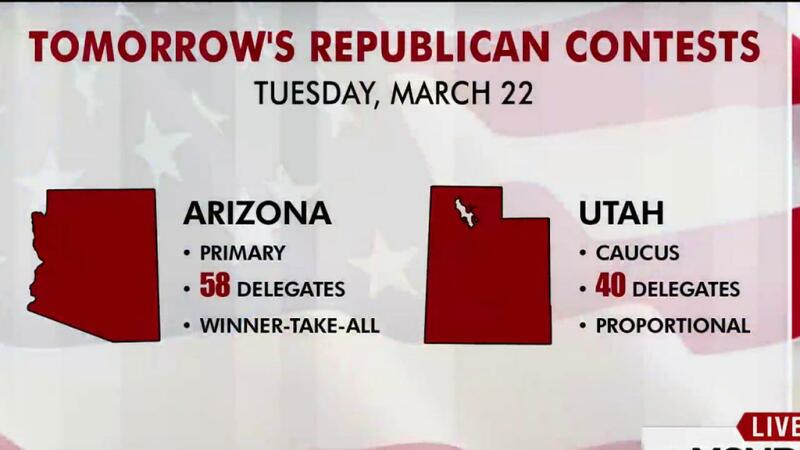 Republicans are voting in Arizona and caucusing in Utah. The first polls will close at 9:00 p.m. ET in Idaho while doors don't close in the GOP caucuses in Utah until 1:00 a.m. ET. Trump leads the GOP field with 685 delegates, according to NBC News' delegate tracker. Ted Cruz is in a distant second with 427 delegates. Hillary Clinton has amassed more than 1,500 delegates to Bernie Sanders 868. Going forward, Clinton and Trump's opponents need to start not only winning nearly every upcoming primary, but doing so by very large margins to shrink the delegate leads of the two frontrunners. For the anti-Trump movement in the Republican Party, which simply wants to stop Trump from getting to 1,237 delegates, it is vital that Cruz and Ohio Gov. John Kasich beat the real estate in winner-take-all primaries and limit his delegate allocation in states that are proportional. If Trump loses the Utah caucuses, Mitt Romney is likely to be given credit, since he publicly said on Friday that he would be voting in the state's caucus for Ted Cruz. Romney is a well-respected figure in Utah, as perhaps the most famous Mormon in America and the man who organized the 2002 Olympics in Salt Lake City. That said, Utah was already a state Trump where was positioned to lose. It is holding a caucus (the mogul does better in primaries), has a large college-educated population (Trump has more support among those without bachelor's degrees) and does not have the kind of tension about its growing Latino population that exists in states like Arizona. Mormons generally attend church frequently, another factor that often makes one less likely to back Trump. And Utah has a very small black population, while Trump tends to be very strong in states with more African-Americans. A candidate who gets more than 50 percent of the statewide vote in Utah collects all of its delegates, so Cruz could get a major delegate haul if Trump is as weak here as expected. Polls have shown Cruz with a big lead in this race, and the Texas senator has tended to do well in caucuses and in Western states. This is where Romney's remarks may have influence. The 2012 GOP nominee urged anti-Trump Republicans in Utah to back Cruz and not Kasich, even though Romney has not formally endorsed either man and campaigned alongside Kasich last week. For Cruz to reach 50 percent, he needs anti-Trump voters to unify behind him, not split between Cruz and Kasich as they have in other states. The Texas senator winning all the delegates would help him narrow his deficit to Trump, but is perhaps even more to the "Never Trump" movement, for which every delegate is significant to stopping Trump from getting 1237. Utah is the kind of state where Trump could finish third, behind Kasich as well. And while that matters little in the delegate count, the results there could be the latest illustration of the concern with Trump among the upper-income, elite bloc of the GOP that prefers candidates like Romney. In contrast to Utah, Arizona is a great state for Trump. The electorate is likely to be older than in most states, and older voters generally prefer the mogul more than younger ones. The political debate over immigration has been tense and long-standing in Arizona. The state has a large Latino population (30 percent) but few Latinos are expected to cast ballots in the Arizona GOP primary. Arizona's electorate is akin to Florida's, but without the Cuban-Americans who voted in the GOP primary there and backed Marco Rubio. Trump has not yet won 50 percent of the vote in any state. Arizona could be the first, and it is winner-take-all. Trump is very likely to leave Tuesday's primaries having won more delegates than any of his opponents. Clinton has won the white vote in some states, particularly in the South, while whites backed Sanders in many states in the Midwest and the North. Latinos have favored Clinton, but they have not been a huge part of the electorate in most states. But Clinton winning more than 80 percent of the black vote in several states has been the decisive factor in helping her accumulate a huge delegate lead. The challenge for Sanders is Arizona, which has more delegates (85) than Idaho and Utah combined. About 18 percent of the voters in the 2008 Arizona Democratic primary were Latino. That number is likely to increase in 2016, with the state's Latino population overall having gone up. And if Latino voters favor Clinton in Arizona, as they have in other states, this will prevent Sanders from a huge margin in the state that allows him to sweep the delegates. And the former secretary of state could win outright in Arizona. This is a perpetual problem for Sanders. Large states tend to have bigger black and Latino populations. Sanders needs to start performing much better among black and Latino voters to have a chance at accumulating the delegates needed for the nomination.